We haven’t discussed about car seats from there sitting positions yet. But after realizing the demand and importance of it we have decided to include it in our list. So, do you want to know more about rear facing car seats and want to introduce yourself with the top rear facing seats? The following article may just be for you. We have already discussed about rear facing seats, why they are better and why should your child be kept in it for the longest period possible. If you haven’t checked them out, do it right now. You will be astonished to know that you didn’t know so many things about this best car seats. The Safety 1st Onboard Air 35 is an iconic example of a rear seat what protects the child with both foam and air. The child safety seats with air protection are always better than the normal ones. This is a rear facing infant carrier what can hold a child from its birth to 35 lbs. we should note here that 35 lbs is a good limit and not all the rear facing infant seats give this wide weight capacity. The next attractive thing of this rear facing seat is the safety level. You will eventually know that the seat is safe when you touch it. Perhaps it’s one of the softest child safety seats that we came ever encountered. This softness along with the other safety mechanisms as five point harness, latch, and side impact protection provides a decent safety. This item is comfortable for both the child and the parents. Why? For the child it has wider space for body and leg. Especially the leg section is extended in this seat that stretches up to 32 inches. The side impact protection in most of the infant seats isn’t that effective and comfortable as they leave a very little room for the head and neck movement. But there won’t be such issues with the Safety 1st. For the parents, it’s a relatively lighter child car seat and comes with a good ergonomic handle bar. This makes the seat pretty easy to carry around. Another great thing is that the Safety can be easily installed even without the base. So, carrying the child in short trips or in taxicabs is not that hassling. Among the other features that many parents found useful, are the removable seat covers and easy washing features. The Safety 1st is FAA approved and meets and exceeds all other safety standards. The seat can be carried inside flights too. So, combination of all this features makes it a great rear facing seat. After including so many good things here are some notable faults that we’ve found out. First of all there have been reports that the car seat jams with the base. Also, some parents found issues with the shade. But these things won’t be too much of a problem if you use the Safety 1st with care. 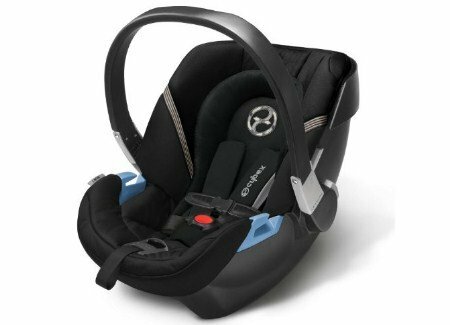 The Cybex Aton 2 is a perfect example of premium rear facing infant seat. The first thing you should take note is that, the seat costs thrice the price of regular rear facing infant seats. Now think, with this price tag what a marvelous product you are going to get. It is always a step ahead when it comes to the matter of rear facing seats. If you can afford it, then it should be the best one money can buy. It looks so different from other child seats that you will hardly think it. Cybex is one of those companies who conduct their own researches to make their product much better. It is a developed version of the previous one. It features a revolutionary new safety mechanism called L.S.P. which is a new linear kind of side impact protection. The L.S.P. 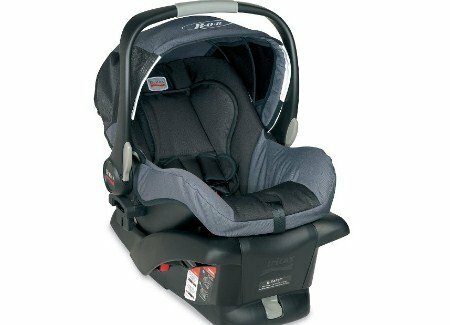 delivers the impact force to the seat’s base and this keeps the child really safe. Also, it’s not too beefy or bulky consuming a lot of space on your car’s seat. It also comes with a slide in canopy what gives the child protection from sun’s deadly rays. Although there have been reports that the canopy jams and snaps under pressure. The Cybex Aton 2 comes in different colors. You can select your one that will match your car’s interior from a wide range of color patterns. The fabric is good but it is not that easy washable. Other than these it’s a nice and lightweight product which is compatible to most of the car’s seat and strollers. This makes the Cybex Aton 2 a travel friendly rear facing car seat. Considering the price you may find it a bit overpriced but he quality makes up for it. 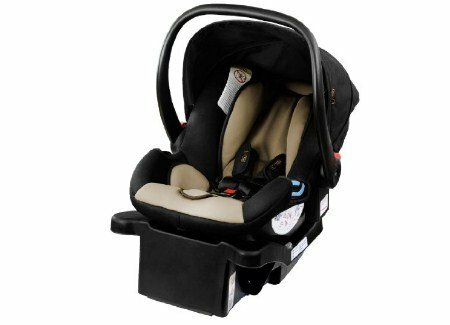 Are you looking for a decent rear facing newborn child car seat within a tight budget? Then, this could be the product of your choice. Firstly these seats sell below hundred dollars and have all the necessary features that a rear facing infant seat should have. The name Cosco Light n Comfy Dx is enough to explain about the product. This seat can hold children up to 22 lbs and honestly it is a moderate capacity. But if you look at the weight of the product you will be astonished. It only weights 14 lbs. Yes, you haven’t mistaken. This makes the seat one of the lightest in the market. There’s a handle that’s ergonomically designed also. So, you can pick up your baby and go wherever you want to in this seat. The safety features include a five point harness and side impact protection and a latch with storage. Also, the whole thing is gently wrapped in energy absorbing foams too. On top of the padding there’s a printed cover what goes quite well with the whole thing. Combination of these things makes the Cosco Light n Comfy Dx a good looking safe rear facing child seat. If you consider its price it will be enough to satisfy you. But there’s an issue with the base. It’s not adjustable. So, you may have to use something else to fit the seat on top of it. So, installation of the seat is not an easy thing. Other than this it’s a good baby car seat within budget. BOB B-Safe infant car seat distributes the protection for side impact forces of the crash. This protection defends from trespass of vehicles and also keeps the body and mainly the head of the infant safe. This car seat is totally complication free and five-point harness has ensured the safety. Its body structure makes it fit as secure car seat. Special kind of foam is used here. It is called Energy Absorbing. The foam liner of energy absorbing reduces the forces of the crash. The weight capacity of BOB b-Safe is 30 pound. 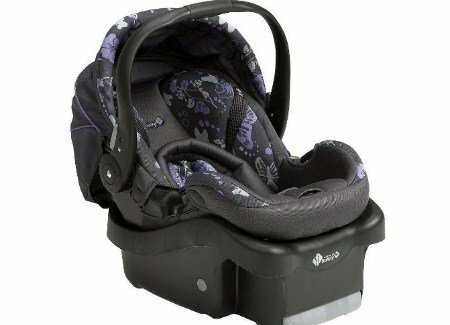 This weight capacity provides one year of comfort and safety to your child. It offers two positions of the buckle and four heights of the harness. To provide extra comfort, it has a removable pillow, pads for shoulder and also pads for the belly. It is a travel-friendly and also lightweight for vehicle and it has stroller compatibility. BOB B-Safe has the Compatible Design of Stroller. What is the bottom line? The protection for side impact is very necessary for an infant. It will give high security to save your child from crash forces. 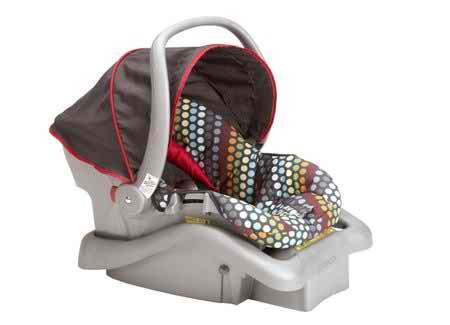 The canopy of the seat blocks the rain, wind and UV rays which are harmful to your baby. The pillow of the seat can be removed easily from the seat. The BOB B-Safe has the smart design and it is very beneficial also. Compatible Design of Stroller gives you the opportunity to use it as a car seat and also as a stroller. Lightweight of the seat makes it in a friendly way for travelling. You can carry it anywhere. The Ergonomic Carry-handle is specially designed to carry your baby more comfortably. The Premium LATCH connectors make the installation easy and quick. The strong structure of the seat and the belts ensure you the high-class security for your infant. The seat has gotten the certification to carry it in air travels. Want to know the best part? It is an ultra lightweight car seat which weight is only 8.3 pounds only. It is a best lightweight newborn car seat on the online market. 4-35 pounds infants can be easily accommodated here. It gives you the high protection for side impact crashes. EPS foam is used for that protection. Mountain Buggy Protect has two options for installation. You can install it with LATCH base and also without the base. Head support and seat wedge have been inserted for the infants. It has 5-point harness and chest clip for safety. Mountain Buggy can be easily from the car to the stroller without spending hard labor and it is of course much compatible than other Mountain Buggies. The removable liner can keep your baby safe, comfortable and snug. Carrying handle has Ergonomic design and its weight is also light. This handle will help you to carry your baby easily. The durable fabrics and pad are washable. They are both hand and machine washable. The look of the car seat is a standard one and also it looks amazing in the car and also on the stroller. What is the bottom line? The lightweight car seat infant has created its own place on the market. Its popularity is increasing day by day. Its lightweight makes it possible to carry it easily and anywhere. Lightweight carrier handle is specially designed to ensure the safety for your infant. Energy Absorbing foam has been used for high protection of the side impact forces. To install the rear-facing seatbelt accurately, the indicators of the blue guide has been provided. Mountain Buggy Company has been making safety assured seats and also designing quality based seats for more than 20 years. That has surpassed the requirements of safety standard. It is very easy to lift the baby from the vehicle to the stroller. This transforming will not disturb your baby’s rest. Protect can be transferred from car to stroller without trouble and spending more time. It has a travel system and receivers are installed on its board. It is compatible with others Mountain Buggies. The fabrics and pad are both hand and machine washable. It will make the cleaning term easier for you. You will get manufacturer’s warranty for one year and it is imported from the China. Do you agree that buying the best lightweight infant car seat for your baby is foremost? The hospitals will advise you to go home with your newborn baby with a suitable infant car seat in your vehicle. Like other baby gear products, lightweight car seat for infant is not a universal need. It is an essential need for your child. You have to purchase it as an essential gear like other essential gears of your baby. Buying the best infant car seat is an essential step for your baby and also for you guys. The primary purpose of this buying guide is to help you to take your decision before purchasing the lightweight infant car seat. When you are driving from your front seat and your baby is staying behind in the back seat, you need to be conscious about their happiness and comfort. To ensure their happiness and comfort, you have to choose the best baby car seat for you newborn baby. 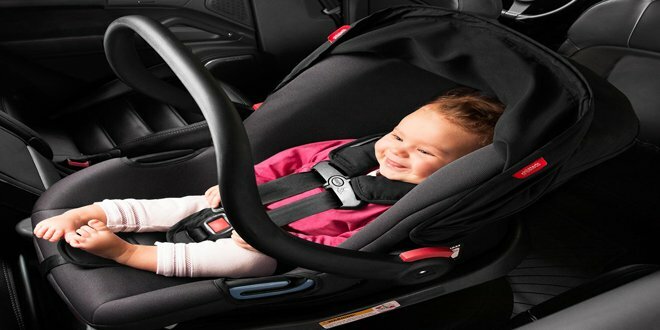 A best lightweight infant car seat can keep you tension free by providing safety. It has all features to give high security and comfort to your newborn baby. If you say about security: it has given the high security for side impact forces. Side extended foam pad has energy absorbing foam. This will save your baby’s neck and head. You can install it on your car with base and also without the base. You can install it easily and safely in your car without any complication. The frame of the body is strong enough to tolerate any outside forces. The lightweight child seat’s accessories are available in the market also. If you want to repair or change, you can buy it from a local market or online. It has a removable pillow for your baby’s comfort. It has enough additional room for the foot. The fabric and pad are high quality. You can wash the seat without any trouble. It will save your time and labor both. You will also get sun protection for your baby also. In the walking place, it will also give its hundred percent to make your moment beautiful with your newborn baby. The reason is it can be easily transferred from the car to the stroller. The infant car seat has been passed all the standard tests and also the crash tests. Experts suggest to use it for newborn. We’d announce the Britax B-Safe as the best priced among the child car seats reviewed up above. This seat made its place because it’s a premium one. Another seat with much cheaper price made it to the review but considering the quality we couldn’t but place it as the best baby car seat on the list. First of all it’s a premium grade product. It has everything that a safety seat requires. The seat is qualified enough to meet and ace over all the safety standards. You will get hardly any point to complain with the Britax B-Safe. The specialty of this top infant car seat is in its SafeCell technology. It has a shelling of compound energy absorbing material covers the seat. It provides a great level of protection while it rests on a deep caring environment. This best baby car seat of 2017 is also very easy to install. The installation may not be as easy as that of a Chicco but it does the job of locking into the seat and locking the baby inside the seat very easily. Remember, it’s an infant car seat, And infant seats can be too bulky. But the Britax B-Safe is different. It consumes less wide space. And less wide space means ample amount of room for other passengers in the car. But there are some problems with it. That is, the area where the baby is kept inside is slightly narrower. If your child has a possibility of becoming overweight or fat we’d recommend you not to buy this seat. Also, the lack of proper head rest sometimes create problem for the child. Other than these this is really a nice product within budget and you would probably be happy with it. Lightweight infant seat has the incredible safety features. Energy Absorbing Foam has been used to protect your newborn child from the side impact collisions. 5-point harness, canopy, portable stroller and other features make it comfortable and safe for your baby. But the weight capacity of the newborn car seat is low. It does not allow more than 35 pounds. The tightening strap of the center harness can create a problem in installing. Purchasing the click-and-go adapter costs you a big amount of money. Our point of view – the lightweight car seat is not only usable for town’s ride. However, it is also very useful both for the long ride and air travel. Before purchasing a baby car seat, you have to know the features and its benefits. And we are helping you here to take your right decision about the best lightweight infant car seat that will fit in your vehicles. The lightweight seat can easily fit in your car and gives all advanced features to its customers. Being low pricey, this lightweight seat for infant will save your some money too.